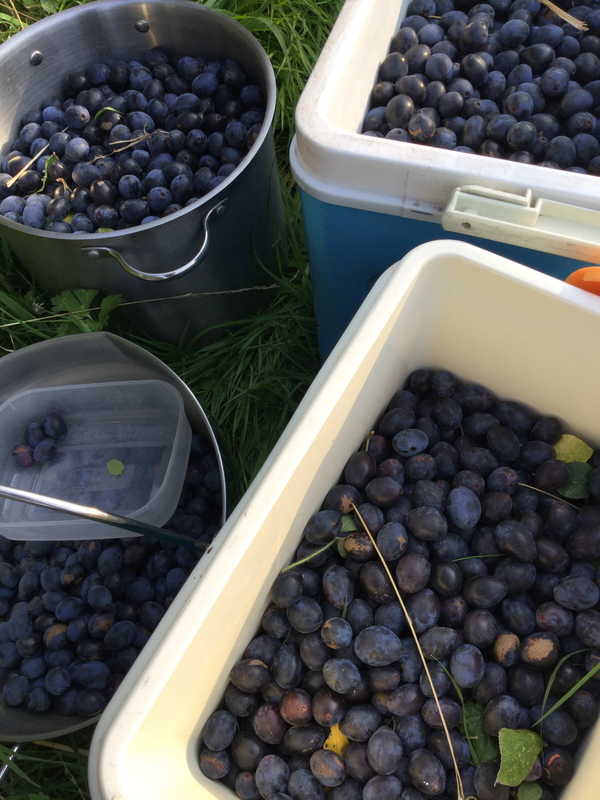 Dawn: I love foraging for food and with my passion for foraging came a recent discovery of a massive hedgerow amass with the velvety purple fruit known as damsons, with their ‘come hither’ look and smouldering under-lashes-look just right for picking. Andrew: They were once very popular but damsons are now quite difficult to find. Dawn: I read something along those lines. They are considered a very English fruit and take their name from Damascus…think damsels in long flowing gowns and tendrils of glossy locks in distress, knights in shining silver armour astride their mighty steeds, the jubilant slaying of fire breathing dragons and the courageous winning of many-a crusade. Andrew: I think you’ll find the majestic damson owes its introduction to our shores from the Romans and not Richard the Lionheart, Dawn. Dawn: Whoever was responsible for unleashing this culinary delight upon these fair lands, thank Heavens they did. 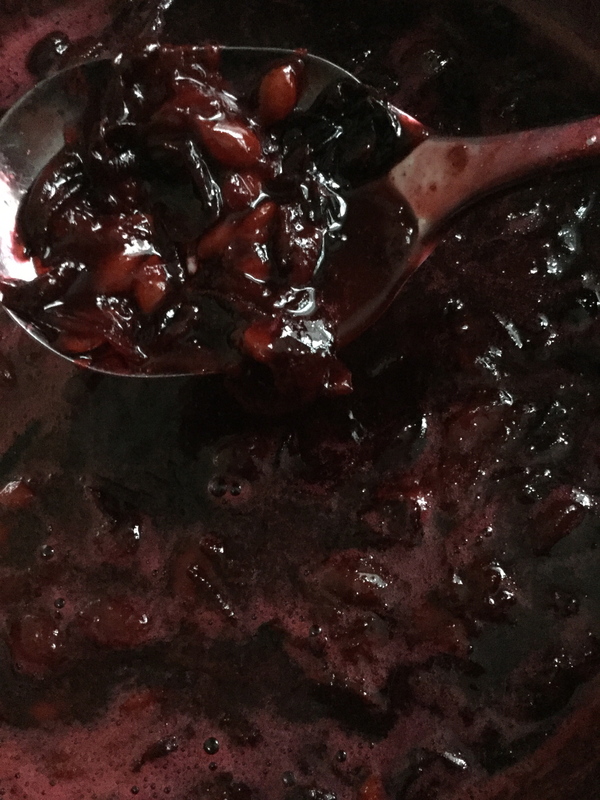 Albeit the damson’s popularity has waned since it’s heyday of pre-WWII, many a British table was then festooned with this flavoursome and versatile fruit which yielded jams, conserves and even damson cheese. Andrew: And a little known fact…it’s juices came in very handy for the dying of cloth in the 18Th and 19th Centuries. Dawn: Commercially grown in the Midlands and North West, the damson lost mass popular appeal after WWII and nowadays tends to be grown by gardeners. Andrew: There are still pockets of areas that favour growing the damson and these include Ludlow which gives us what they call the Shropshire prune, a smaller version of the damson, and the Lyth Valley in Cumbria lays claim to producing a relative of the Shropshire prune which is alleged to be “improved by unique conditions”. Dawn: Prune? Interesting as the damson is a subspecies of the plum. Andrew: Yes, and further afield in South and Southeast Asia, as well as in Jamaica can be found variations of the damson. 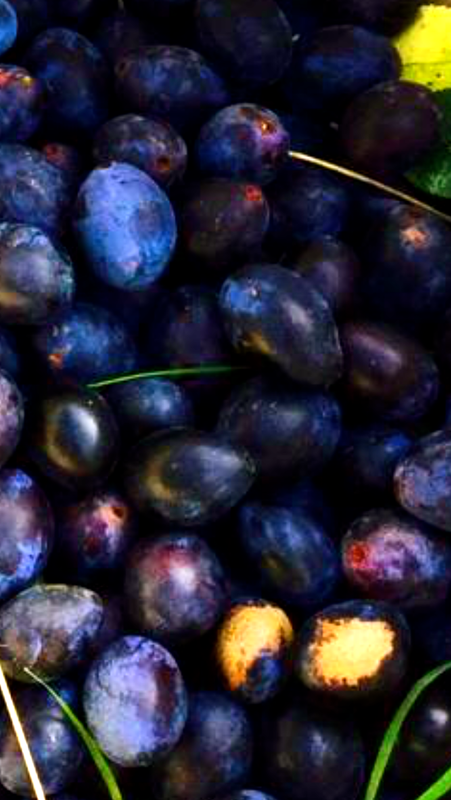 Dawn: In the here and now, this velvety purple gem of a fruit can give a very swashbuckling taste but not if eaten straight from a hedge as its rather astringent pre-cooking. Cooking unleashes these beautiful fruits depth of flavour making their end products ideal as accompaniments to meats, such as in the form of pickles or made into puddings as well as jams, conserves and the often forgotten damson cheese. Place a small side plate or saucer in the fridge. Place 3-4 jars (454g size are ideal) washed jars in a warm oven, at gas mark 3, electricity 160⁰C, electricity (fan) 140⁰C for about 10-15 minutes. Remove and set aside to slightly cool while you get on with the recipe. 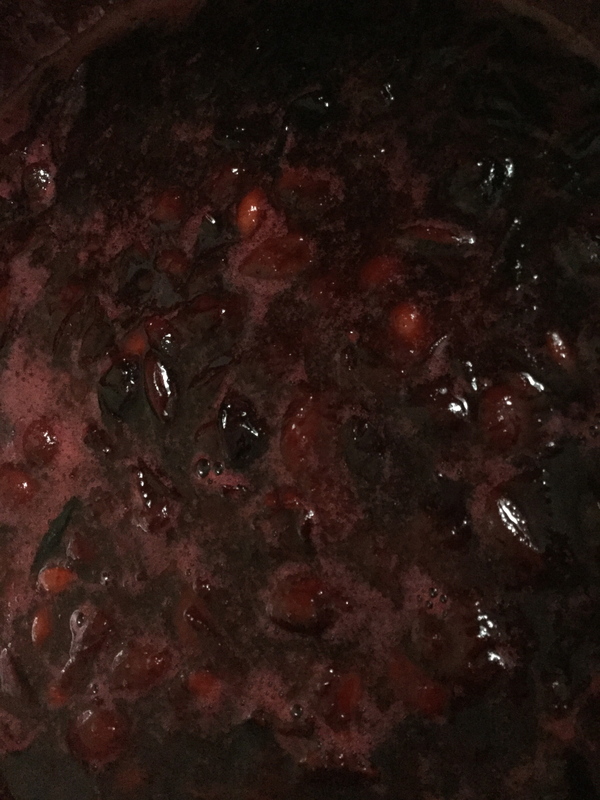 In a large saucepan or preserving pan, put the damsons and water. Andrew: Do we need any lemon juice, Dawn? Dawn: No, as damsons are high in pectin which is the natural setting agent giving a good set to the conserve. Bring the ingredients up to a simmer. 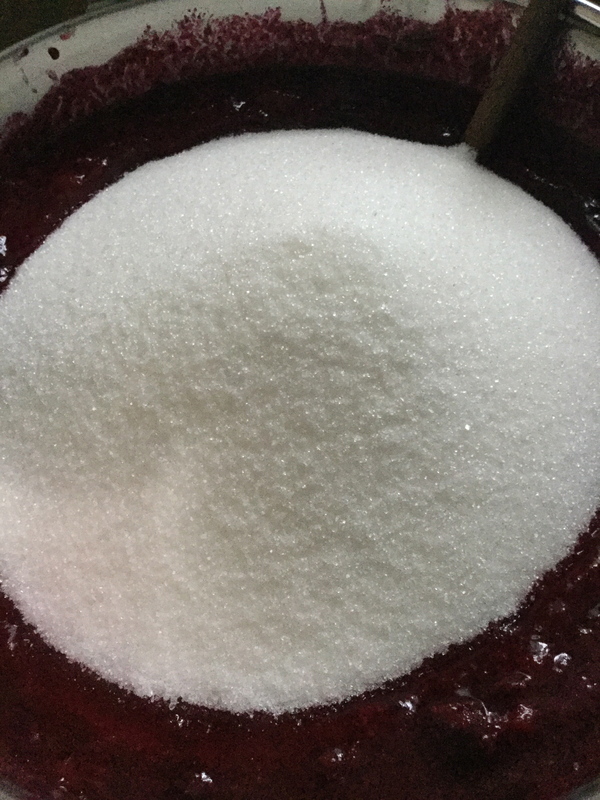 Remove the pan from the heat and add the sugar, stirring continuously, until the sugar is dissolved. Return the pan to the heat, bring to the boil and boil for about 10 minutes, stirring frequently. 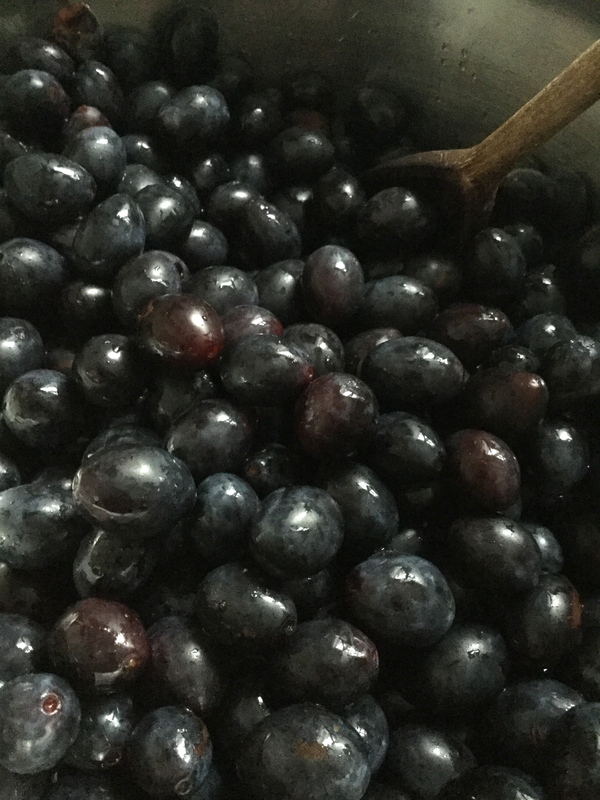 The damsons will start to ‘pop’ as they begin to ferment. At this point, start to look for the pips and with a large, slatted spoon begin to lift out the pips, leaving behind the fruit flesh. Dawn: Be patient as the fruity flesh parts company with the pips. The rewards are well worth the endeavour here to make sure you have removed all the pips. Test for a set and when the setting point is reached, take the pan off the heat and remove any scum that may have accumulated on the surface with a slatted spoon. 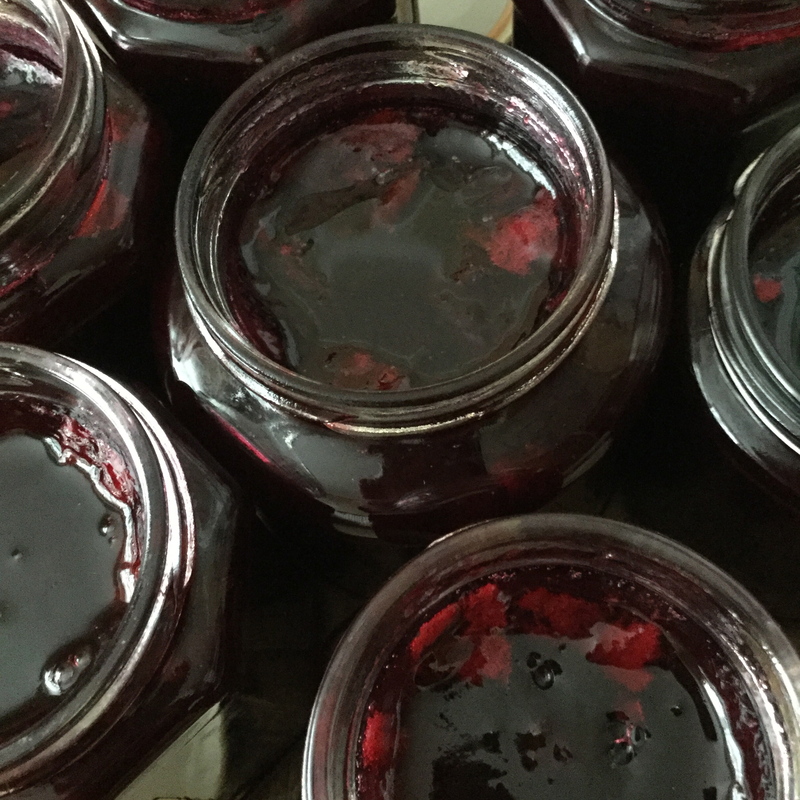 Andrew: Test for the set of the conserve by simply taking the chilled saucer from the fridge, plopping a small amount of the jam on to it, allow the jam to cool and with a clean finger, gently push through the jam: if the surface wrinkles, the setting point has been reached. 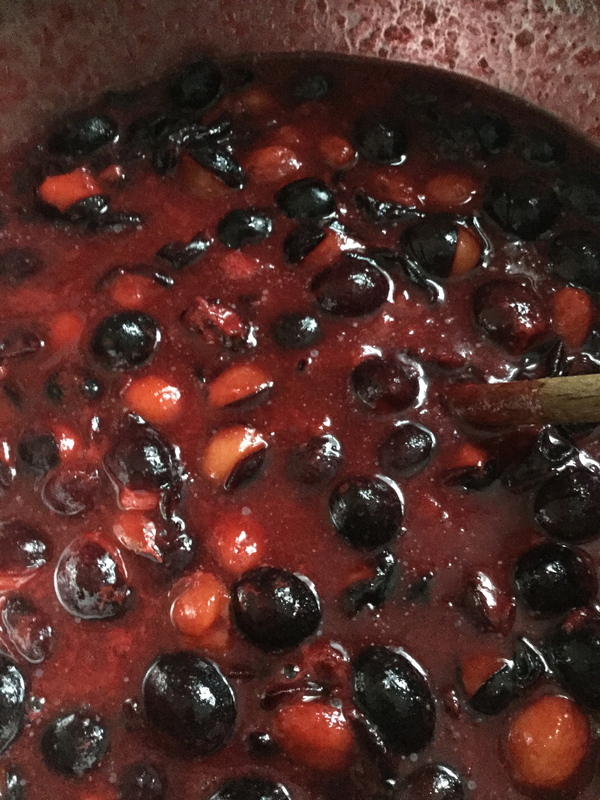 Dawn: Do remember to remove the pan from the heat as you test for the setting point as you don’t want the jammy fruity mixture to become over boiled, which weakens its setting property. Leave to stand for 15 minutes before potting and covering. 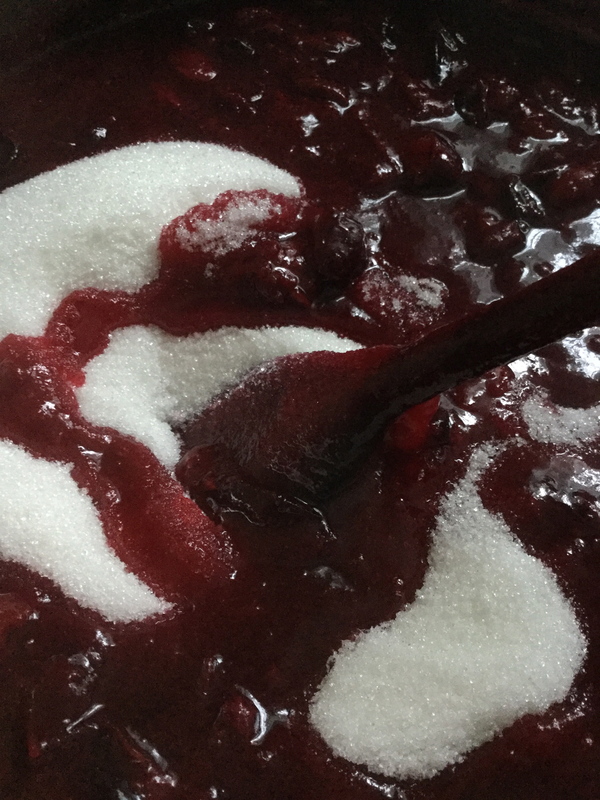 Dawn: Wipe the outside and inner lip of the jars with a damp warm cloth while the jars are still warm and tradition sees us put wax discs on the surface of the jam, making sure the discs lie flat. Andrew: We used small pieces of greaseproof paper making sure they covered all the jam and came up the sides of the jar slightly. Dawn: Don’t forget to label the jars with their contents along with the date, and they should, if stored in a cool, dry and dark place, keep for up to a year…if not devoured beforehand! For more in the series “How To…” follow the Love Food team at www.forfoodlovers.wordpress.com either via email (your email address is safe and we take privacy very seriously) as well as daily doses of food insights, inspirational ideas and thoughts, and the odd cat photo or two on Twitter @Love_Food_UK as well as Facebook and Mumsnet, too. And let us know what you cook and how it goes, please: we love to hear from you.